Wireless storage is in vogue right now. G-Technology by Hitachi revealed Wednesday its G-Connect, a 500GB portable hard drive that can serve up content wirelessly via Wi-Fi. The drive, available in July, goes farther than other recently announced wireless drives (Seagate's comparably priced GoFlex Satellite Mobile Wireless Storage 500GB, and Kingston's flash-based Wi-Drive). 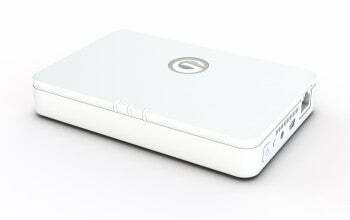 The G-Connect's primary purpose is to allow any device--a laptop, a tablet, a smartphone--to access the drive via 802.11 b/g/n Wi-Fi. But it's a fully functional external hard drive, too, with a mini-USB 2.0 connector on board. And, it has a gigabit ethernet jack, as well. This flexibility expands the usefulness of the drive, mixing up the types of scenarios you might use it under: If you're at a hotel, for example, you can share the hotel's ethernet across multiple devices, even while using Wi-Fi to access the hard drive data, too. Personally, though, I find the built-in wireless access point less interesting; I'm used to finding Wi-Fi at all the hotels I go to, and being able to have more than one device connected to the Wi-FI at the same time. The drive lacks a built-in battery--a feature found on its primary competitor, the aforementioned Seagate GoFlex Satellite. Without the battery, you have to be near a power source to use the drive wirelessly; it includes a compact charger and a car power adapter. Alternatively, you can buy an external battery. G-Technology alludes to one in its press release, but provides no further info; or you can buy a battery like the Phonesuit Primo or iSound Portable Power, either of which will have enough juice to power an Apple iPad 2 or the G-Connect. At launch, G-Connect has an iOS app for use on Apple's iPhone and iPad; or you can access the drive through a Web browser. The interface there looks promising, but what I saw in an early demo still had some rough spots that will, hopefully, be smoothed out by the time the app and drive launch. As I saw with the Seagate drive, the wireless capability is less meaningful if the app supporting those features is not well designed. The G-Connect drive itself appears well-designed, with a power button to turn the Wi-Fi on and off, and a reasonably compact case (albeit it a tad heavy, at 9.7 ounces). The DLNA-certified drive is rated for wirelessly streaming up to three high-definition movies or five standard-definition movies, simultaneously. If all you're doing is data streaming, the G-Connect supports five devices or more.